If you’ve been paying attention, then you’ve probably seen us shouting about the very exciting news that we’ll be publishing Lisa Sterle’s truly fabulous Modern Witch Tarot in autumn 2019. Thanks to Lisa’s incredible fans and their overwhelmingly positive response to her work, we saw a few snippets of the deck (one of our favourites is the Ten of Swords, shown above) and just had to jump on the chance to publish it. Sign up for our newsletter for more info and to hear about a special edition of this deck – only available on the Liminal 11 website – when it’s announced. Modern Witch Tarot is a stylish interpretation of the tarot by acclaimed illustrator Lisa Sterle. 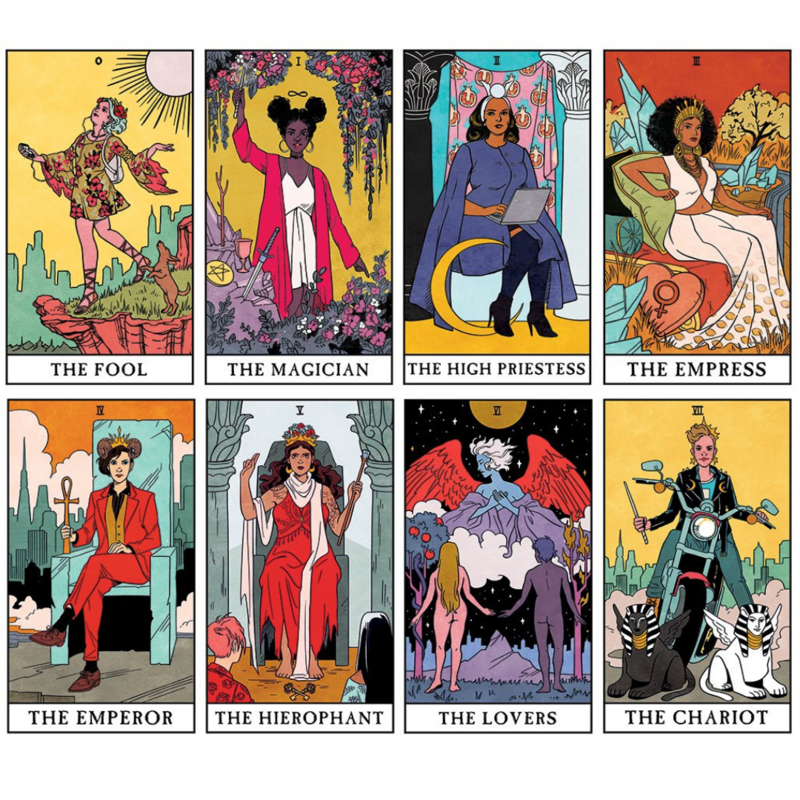 Marrying traditional symbolism with youthful, stylish characters and items from our modern lives, this bright and colourful deck brings a bit of fun to the tarot! Pricing and further details will be announced soon. Watch this space! Lisa Sterle, comic artist and illustrator from Columbus Ohio, is on a mission to create narratives of women discovering their own magic and strength from within. Her first foray from illustration into comics was with the release of horror comic Long Lost (2017) which was met with critical acclaim. She is now finishing Long Lost, while working on a new upcoming horror title, Submerged. We are overjoyed to share with you a project very close to our hearts: The Modern Witch Tarot by the fabulous Lisa Sterle! Lisa is the creator of critically-acclaimed horror comic Long Lost and is well-known for her bright, expressive illustrations (we highly encourage you to visit Lisa’s website to drool over her stunning work). The logo was designed by Kaylee Davis. 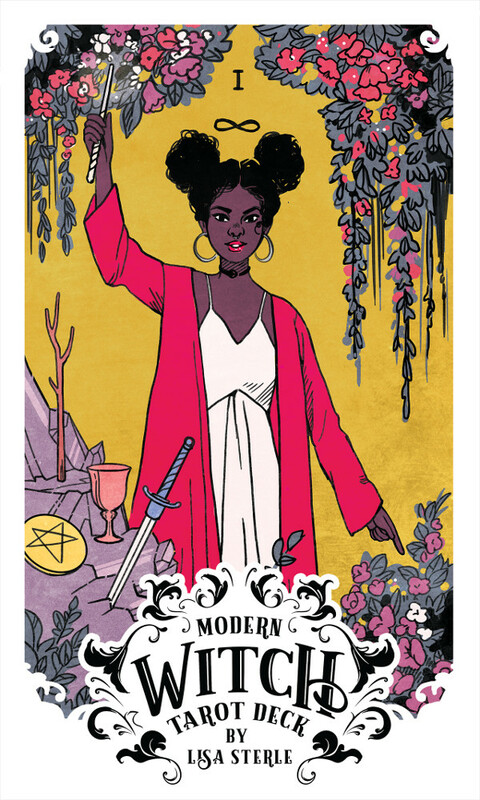 The Modern Witch Tarot is a fun take on the tarot, marrying traditional symbolism with youthful, stylish characters and items from our modern lives. This is a deck we’ve had our eyes on for quite a while now, and we are over the moon to be publishing it in autumn 2019! Follow us on Twitter, Instagram and Facebook to see images from this exciting tarot deck as they are released. And sign up to our newsletter to hear about when it opens for pre-orders and for other exclusive offers!